Keeping your child healthy goes beyond packing fruits and veggies and making sure they exercise. Is there such a thing as too much fruit? How many calories should they be eating each day? What type of protein is best for a small child? Understanding the answers to these questions can help you pack healthier lunches for your children each day, and using a bento lunch box can help you make packing a quick and easy process on busy mornings. Here’s what you need to know in order to create healthy lunches that meet the nutritional needs of children ages 4 through 12 each day. Calories help children maintain their energy and grow strong, and they should come from a variety of healthy foods, including proteins, fruits and veggies, dairy, and grains. However, too many calories can cause unhealthy weight gain, so it’s important to moderate the amount of calories your children consume each day depending on their activity levels and age. Children who play sports, for example, may require more calories than children who do not, and older children who are not active should still consume more calories than younger but equally inactive children. Girls and boys have different caloric needs as well. Girls ages 4 to 8 should generally eat 1,200 calories if they are not particularly active, between 1,400 and 1,600 calories if they are moderately active, and 1,400 to 1,800 calories if they are very active. Boys in the same age range, meanwhile, should eat a minimum of 1,400 calories if they are not active, between 1,400 and 1,600 calories if they are moderately active, and 1,600 to 2,000 calories if they are very active. Children who are between 9 and 12 years old can generally eat more calories per day without negative effects due to their rapid growth and high energy levels during this stage of their lives. Girls within this age range should eat between 1,400 and 2,200 calories, depending on their activity levels, while boys should eat between 1,600 to 2,600. Your child’s pediatrician can chart their growth to help you determine the proper caloric intake for your child at each stage of their development and adapt these guidelines to their unique lifestyle and needs. Children between 4 and 12 years of age should be getting between 10 and 30 percent of their daily calories from proteins, such as eggs, chicken, and lean, minimally-processed meats. Vegetarian families can serve children protein-rich veggies and legumes, such as lentils, peas, and peanut butter, depending on their family’s needs. 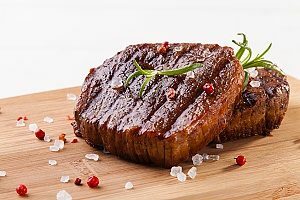 Kids generally need about .95 grams of protein for each kilogram of their body weight each day, making the recommended amount for older children about 34 grams per day. Adequate protein can help children develop healthy bones, muscles, skin, and blood as they grow, making protein an important part of a child’s daily diet. Big servings of fruits and veggies can fill a child up with healthy carbs and plenty of nutrients. However, too much of either one can be detrimental, and a good balance is necessary for a healthy kid. Children between 4 and 5 years old should have about 1/3 cup of fruit and 1/3 cup of veggies daily, while older children between 6 and 12 years can have up to half a cup of each daily. 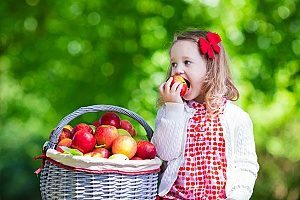 Half an apple, a medium pear, a small wedge of watermelon, and the appropriate serving of raw or cooked carrots, broccoli, or spinach can all be healthy options to meet your child’s fruit and veggie needs each day. Fruits and vegetables can make an excellent side dish to put into a bento lunch box, and a serving of fruits can double as a sweet after school treat that satisfies sugar cravings without dipping into dessert. Many people choose to avoid grains because they are anxious about the amount of carbs that breads, pastas, and other grain-based foods can contain. Unless your child has a gluten sensitivity, however, grains can be an important source of energy and growth-supporting nutrients. Children between 4 and 6 years old should have about six servings of grains per day, while children between 7 and 12 can have up to nine servings. A healthy serving of grain can include one slice of whole-grain bread, one cup of cereal, or half a cup of oatmeal, rice, or pasta. Grains are easy to incorporate into a bento lunch box in the form of sandwiches, pasta salads, and more. 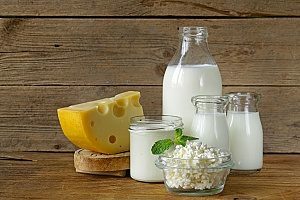 Dairy products, such as milk, cheese, and yogurt, can give children the calcium they need to develop strong bones and teeth. Dairy can also provide other nutrients, such as vitamin D and protein, to help them develop healthy bodies. Children between 4 and 6 years old should have between two and three servings of dairy — such as half a cup of milk, an ounce of cheese, or half a cup of yogurt — each day. Older children can have two to three servings of dairy per day as well, though their servings can generally be larger. Kids between 7 and 12 can eat one-cup servings of milk and yogurt each day and one ounce of cheese for their daily dairy needs. Consult with your child’s pediatrician to determine the exact amounts of fruits, vegetables, grains, dairy, and protein your child should be eating each day to reach their ideal daily caloric intake. Once you’ve determined the best meal plan for your child, consider packing it in a bento lunch box. These boxes contain dividers that create separate compartments within the box, which are ideal for properly portioning food for each meal. Many bento lunch boxes are made of metal, which are free of harmful chemicals found in plastics, and consist of a double-walled design that can keep foods as hot or cold as they need to be until lunchtime. Bento lunch boxes are the perfect companion to the healthy, nutritious meals you will be able to prepare for your child each day, whether they’re going to school or summer camp.